4-20mA Signal, 2-wire operation. Dial Gauge Indication. 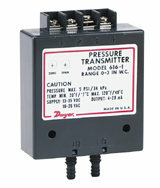 Series 616 Transmitters feature execptional ±0.5% accuracy in several factory calibrated ranges. Choose the one just right for your application. Span and Zero controls included for fine tuning and minor re-calibration in the field.